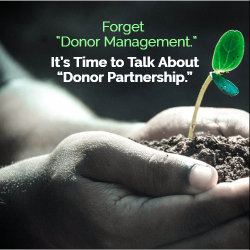 Every individual who interacts with the organization should be considered a potential donor, and ensure that every experience that individuals have with the organization offer them the opportunity to feel close and connected with the mission. Always offer individuals who interact the chance to learn more about the organization’s impact, who you serve, and feel the mission in a way that is personal for them. Make it Easy. Being a donor is harder than you may think. Often it isn’t easy to find the information you are looking for an organization’s website. Other times it isn’t clear which staff member to call for assistance or even to make a gift. Fundraising professionals (and all staff members) need to think of themselves as “personal concierges” who strive to provide donors with exceptional service. Make sure you provide all the information they will need to attend an event (date, time, location, room, directions, etc.) 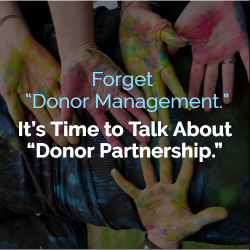 Your donors are investing their money in your organization; they deserve white-glove service. You want to make it as easy as possible for someone to work with your organization so that they are eager to contribute. Listen More Than You Talk. Very few people prefer to be talked at rather than listened to. Donors are no exception. They want to tell you about their lives, their interests, and their reasons for giving. The more you listen, the better you will understand a donor’s motivation. And the more you understand a donor’s motivation, the better your case for support to the donor can be. If a donor has no interest in 80% of what your organization does and loves 20%, that is important to know – no need to waste your time sharing details about topics that don’t interest the donor. For instance, at Oliver Scholars, we have some donors who care greatly about our preparation program for high school and others who care most about where our students ultimately go to college. We individualize communication based on our audience. Ask for input. Partnerships involve give and take. Donors are investors who not only want to share their money but also their insight and advice. You don’t have to take all the advice you are given, but at least be open to hearing what your donors think. You already know that their values align with yours because they have chosen to invest in your mission. An outsider’s perspective can be invaluable. At Oliver Scholars, we regularly solicit feedback from our donors through email queries, one-on-one meetings, committee discussions, and board meetings. Keep your donors informed. Donors want to know where there money is going. What are your organization’s recent achievements? Give your donors a chance to celebrate them with you by keeping them informed. Of course, quantitative results are always better than vague descriptions of success. Have there been setbacks? Donors appreciate honesty and transparency. No donor wants to be surprised by learning bad news from a third party. Meanwhile, don’t forget to invite donors to program related events! Give them a chance to meet staff, clients, and other partners. Remember that donors don’t owe you anything. It’s easy to fall into the habit of expecting donors to give (and getting annoyed when they don’t). But donors don’t owe you anything. It’s their money. How would you like it if someone expected you to hand over your hard-earned cash? Every gift a donor makes is an act of generosity. That means there is nothing more important than saying “thank you!” Your “thank you” needs to be heartfelt, timely, and personalized. (A form letter will not do!) Pick up the phone, send a card, at the very least, write a personal note on that tax acknowledgment letter. Without proper stewardship, even your most loyal donors may drift away. David brings to Oliver over 15 years of experience working in the field of educational access for high-achieving students. He previously served as Director of Education at NJ SEEDS, where he oversaw programs serving 750 students. He is the author of four books and dozens of articles and has taught at Princeton University and has served as a Visiting Scholar at Columbia University. David holds a B.A. from Brown University and a Ph.D. from Harvard University. His daughter Jordan is a graduate of Packer Collegiate. He has spoken at many national conferences, including the annual meeting of The College Board Forum, The Association of Boarding Schools (TABS), The National Partnership for Educational Access (NPEA), and the National Association of College Admissions Counselors (NACAC). He serves on the board of the National Association of Independent Schools (NAIS) and is currently a visiting scholar at The New School.